On February 22, 1995, Philip Garrett Panitz, our founder and lead federal tax litigator, argued this case to the United States Supreme Court. The case involved the IRS seizing escrow proceeds from the sale of a personal residence by Lori Rabin Williams. The proceeds were seized to allegedly pay off the tax debt of Ms. Williams' former husband. However, the former husband had no interest in Ms. Williams' house, she had obtained the house in her divorce after paying off considerable debts of her ex-husband in consideration for her being awarded the house. 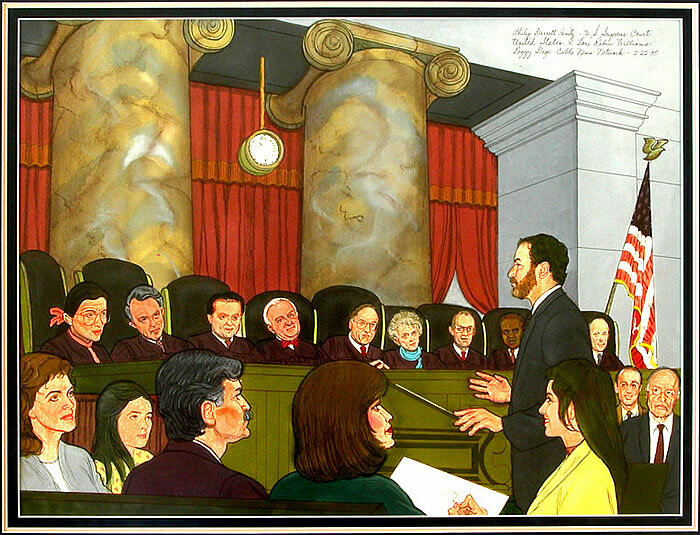 Original painting done by CNN sketch artist of Philip Garrett Panitz arguing to the United States Supreme Court in Williams vs. U.S.
An action for a refund of the seized proceeds was commenced against the IRS in United States District Court. During the discovery phase prior to a trial, the IRS stipulated that they had seized the escrow proceeds erroneously, that Ms. Williams ex-husband had absolutely no interest in her house. Nevertheless, they refused to refund the money. Their refusal was based on a technical legal argument, that Ms. Williams had no standing to sue the IRS for a federal tax refund, since she (according to them) was not the “taxpayer” who owed the money and could point to no federal statute that permitted this type of suit by a third party. Our lead federal tax litigator, Mr. Panitz, argued the case for Ms. Williams at the District Court level and indicated to Chief Judge William Matthew Byrne that Section 1346 of the jurisdictional statutes did provide relief to a taxpayer who had been the subject of an IRS erroneous collection action. Judge Byrne disagreed, citing a long line of cases opined by Supreme Court Justice Antonin Scalia that waivers of “sovereign immunity” must be narrowly construed, and the 1346 federal statute was too ambiguous to determine if it contemplated a third party paying the taxes of another in its jurisdictional grant. Mr. Panitz appealed to the United States Court of Appeals for the Ninth Circuit, the venue for tax litigation in this case. The Ninth Circuit reversed Judge Byrne’s decision, indicating that the statute was unambiguous on its face, namely that Ms. Williams was the “taxpayer” since she paid the tax, and the IRS had agreed the collection was erroneous. The Appeals Court granted a refund plus interest to Ms. Williams, and a victory to our federal tax litigators. The IRS then appealed the case to the U.S. Supreme Court. The Supreme Court takes perhaps 80 cases of the 8,000 appealed to it each year. Surprisingly, they granted certiorari and heard the case. 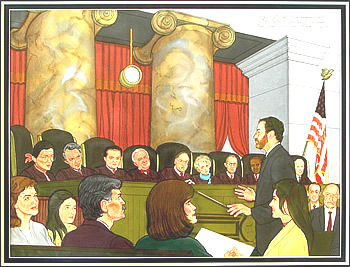 The United States Supreme Court decision rendered in 1995 in favor of Ms. Williams and sustaining the opinion of the Ninth Circuit changed the tax law in the United States. No longer could the IRS hide behind “sovereign immunity” to defend taking money from a third party and refusing to give it back when challenged that the taking was in error. The case has been cited as precedent repeatedly by Federal Courts across the United States and has been written about in over 100 law review articles on the subject of tax litigation. Click Here To Read The Full Text of This Landmark Supreme Court Decision On Tax Law.